I would consider this the best thing that happened to my makeup kit, like EVER. I know that at first glance at the title and the product description, you're all probably chuckling in disbelief as to why girls would stupidly shell out so much money for this useless product. But let me walk you through why this was probably one of the wisest makeup purchase decisions I've ever made. 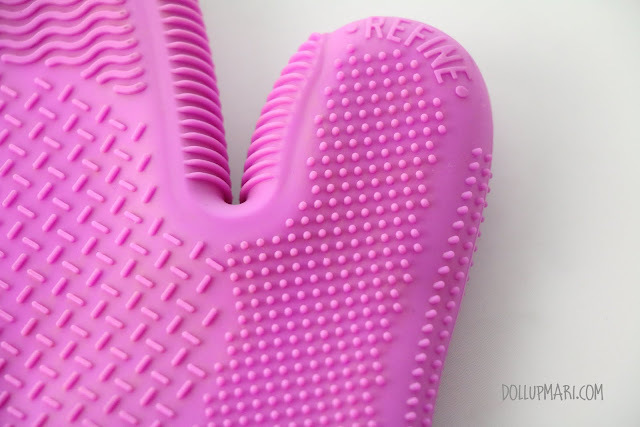 So like everybody not familiar with this product, like a year ago I was also laughing in disbelief as to why would girls stupidly spend $40 and its equivalent to buy a silicone glove you can buy from a baking store. 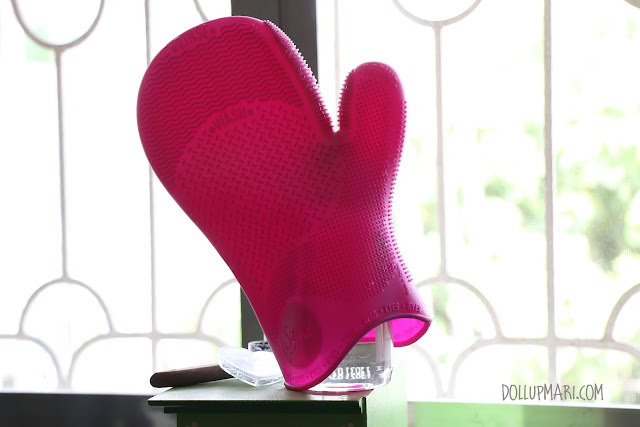 Or even not a baking store, you can also get similar potholders at department stores for a 1/10 the cost of the glove. 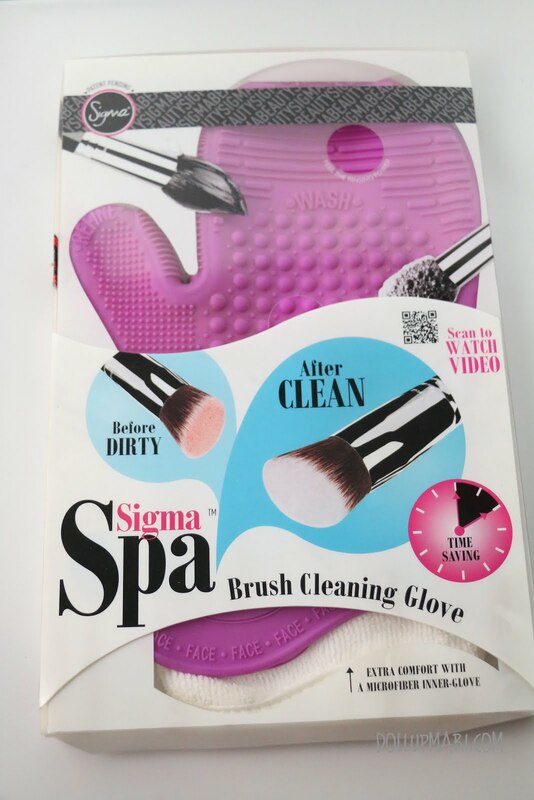 However, I decided to give it a try when I ordered a bunch of Sigma goods and decided that it would be much more convenient to put this into the purchase rather than make a separate transaction. I also thought that it may help to ease my suffering in brush cleaning. WELL IT HAS BEEN THE BEST THING THAT HAS HAPPENED TO MY BRUSH CLEANING. This is mainly because before I got this glove, cleaning brushes was a pain. For an average kikay girl with ten brushes or less, cleaning brushes is a simple task, but for someone like me who does makeup on other people and myself (I have about 80++ brushes meant for gigs and could use up to 30++ in a gig, alongside the 20 brushes I personally own and use often), it takes me about an hour to wash my soiled brushes for the day. In the case of when I was still in makeup school, it was a task I never looked forward to because I had to wash 30 brushes on a daily basis and deal with all the dirt. At the time I still did not have brush cleaner (as it was too expensive given that I had just shelled out so much on makeup school) and had to clean brushes by rubbing them in a tub of moistened soap or makeup remover and scrubbing them on my palms. A lot of the times, after cleaning all the brushes, my hands would be super duper pruny and my palms would already feel sore from the scratches from the ferrules. On the other hand, if I didn't scrub well, the brushes wouldn't get clean and would still have a lot of residue the next day. And in general the time period was just unreasonably long-- I could use the time on snacking or resting, or cleaning my other makeup. It was a really boring task. The next issue was that since I didn't have a legit way to squeeze the excess water out, there have been times that my brushes dry poorly, as in they smell really sour and awful after instead of smelling like the shampoo or body wash I used. There have also been times that towels at home have been soiled as the excess makeup only came out during the drying process. The brush cleaning glove has helped to address a lot of these issues I had. First was that since it was a glove, it meant that my hands were no longer pruny nor sore after cleaning as it was the one that took on all the water. I also had begun to save soooooooo much time. 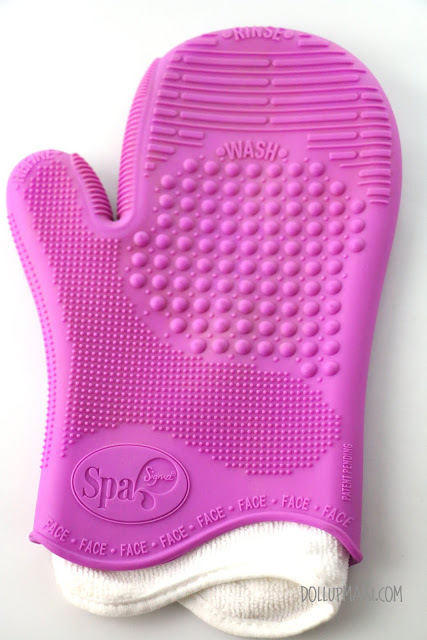 From an hour to clean my brushes, I now spend 15 minutes or less to wash all my brushes thanks to this glove. 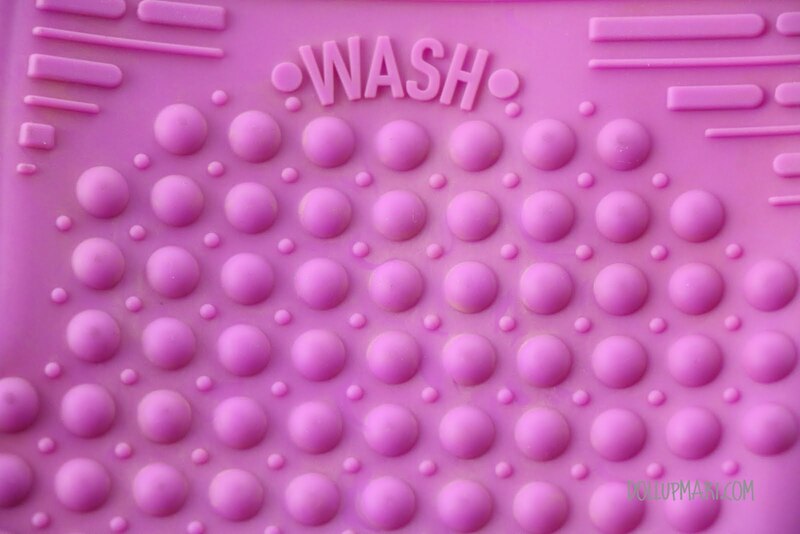 It has also saved me a lot of energy as I needn't scrub as much and I can now afford to wash several brushes in a single scrubbing. As for dirt removal it has also been very efficient, and it's also got a mechanism to squeeze out excess water, which is why I have now avoided smelly brushes and leftover makeup residue on my brushes. 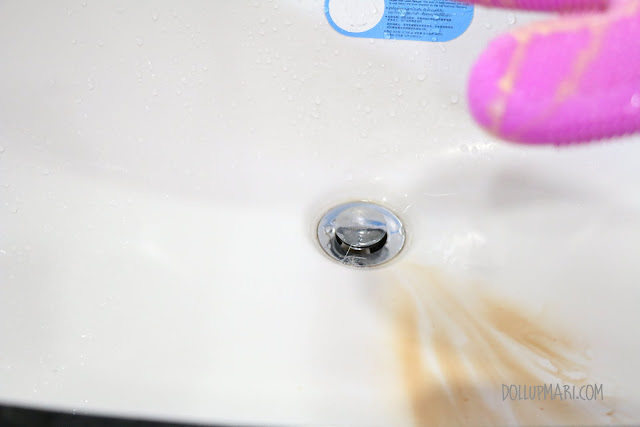 Usage is also very very easy, as this photo contains the steps for cleaning. You merely have to scrub the brush on the right texture with soap, wash it in another texture, and squeeze it in the squeezing area. I'll show the textures in more detail in the next few photos in this post. This is a two sided brush made of high grade silicone. In this photo is the face side of the brush, while the other side contains the eyes side of the brush. 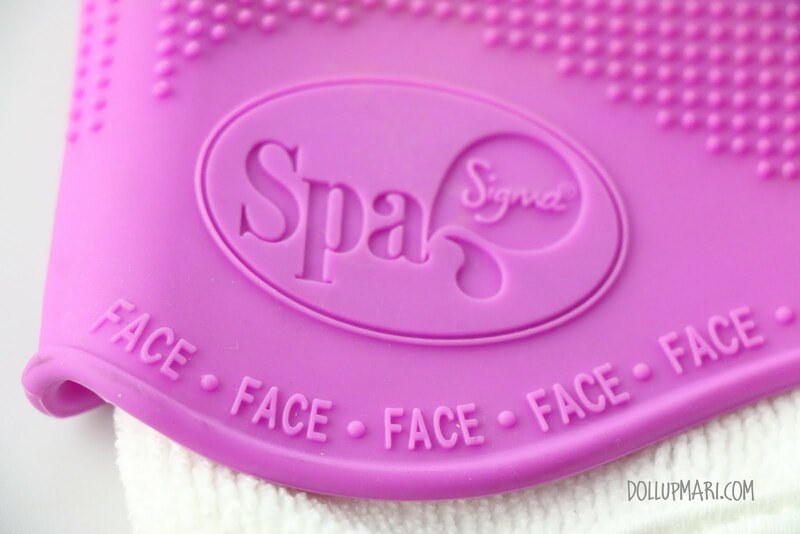 As the name implies these are their recommended surfaces for cleaning face brushes. 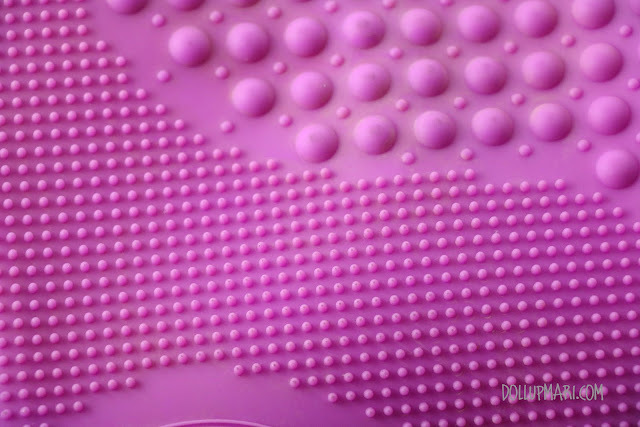 The brush has 6 distinct textures spread out on its two sides meant for different tasks and purposes. 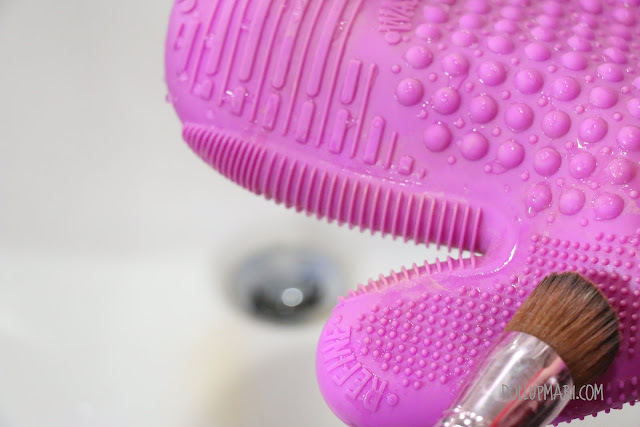 It also comes with a microfiber insert brush to make washing brushes a comfortable event. 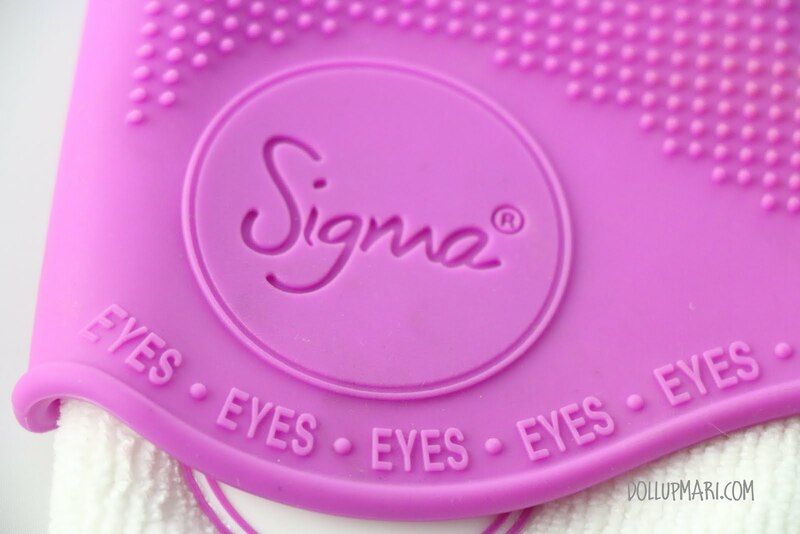 Up close you can see the Sigma logo on the bottom of the eyes side and the logo for the product on the bottom of the face side. This is the face side up close. This is the rinse texture for the face brushes, and I use it for removing soap off the brush and also for giving the brush an initial wetting. I like to use this surface for initial wetting because some brushes, especially those with synthetic fibers, do not get fully wet that quickly and may not lather well by merely putting them under the faucet, which is why this texture comes in handy. 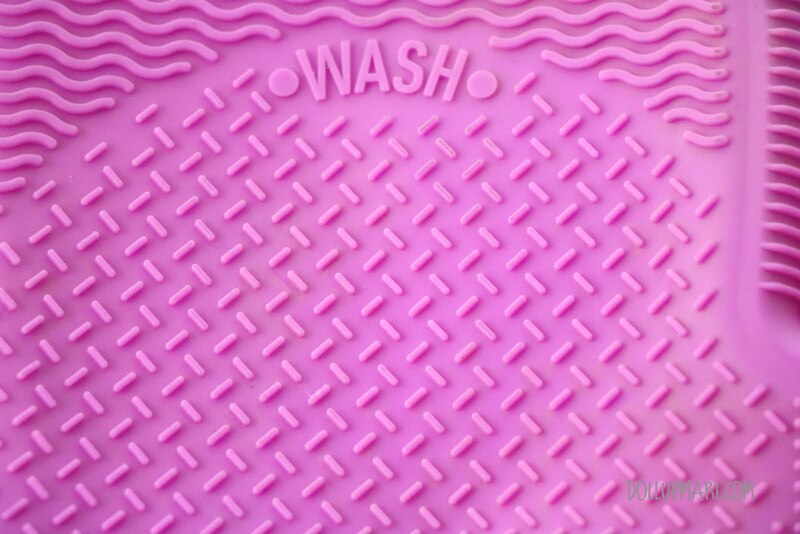 This is the wash texture for the face brushes. This is by far the most useful texture in the brush and the main reason why I love this glove so much. I see Pinterest and makeup forums on Facebook flooded with allegedly cheaper dupes than this, but no dupe has this surface. 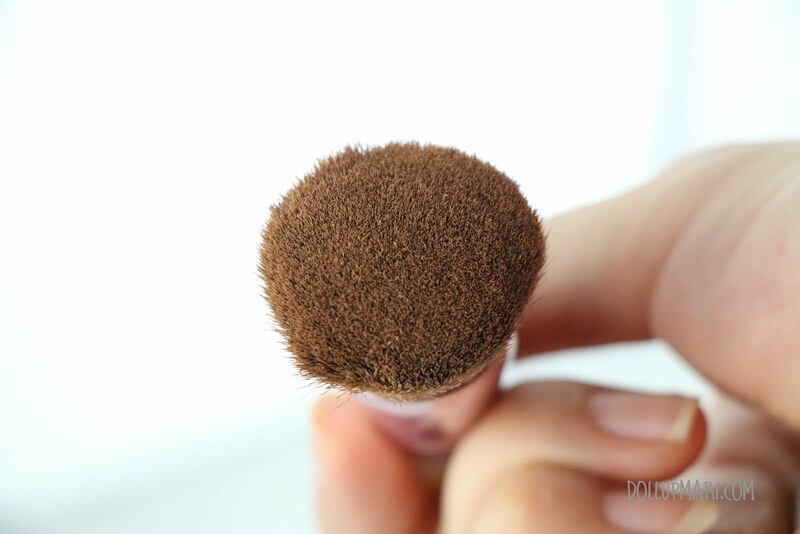 This surface is bumpy yet not too bumpy so as to damage the brushes, which is why you can really get a lot of the foundation and powder off your face brushes. 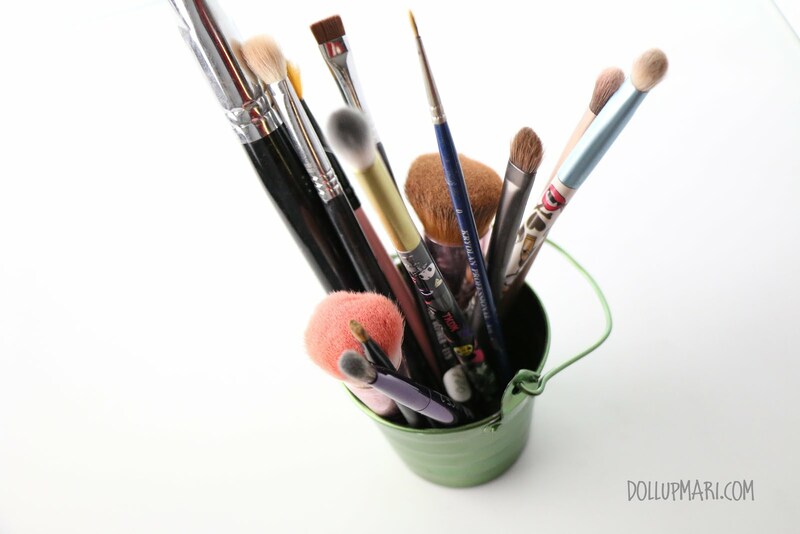 Eye brushes are easy to clean, a mere soaping or a mere 30 minute (or even shorter!) dip in makeup remover will suffice, but all of you know that this is not the case with face brushes. You can dip a face brush in makeup remover for a day and all that will happen is that its hairs will fall off, and for cake foundation, you can scrub all you want with your hands but it will still be dirty afterwards. 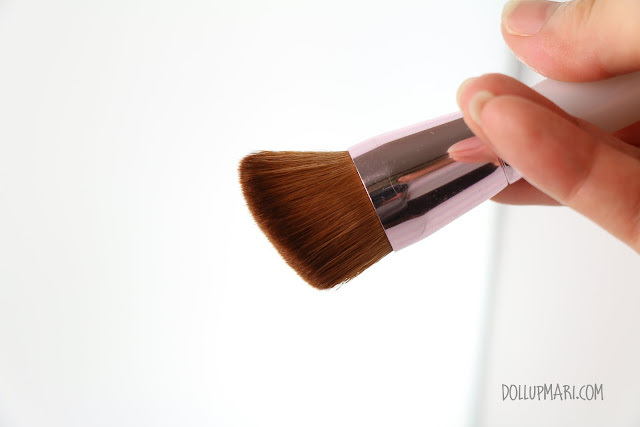 This is where the value for money for the product comes from because there are very few non-consumable products out there in the market that can efficiently remove foundation residue from brushes. And lastly for the face side, this is the refine texture. 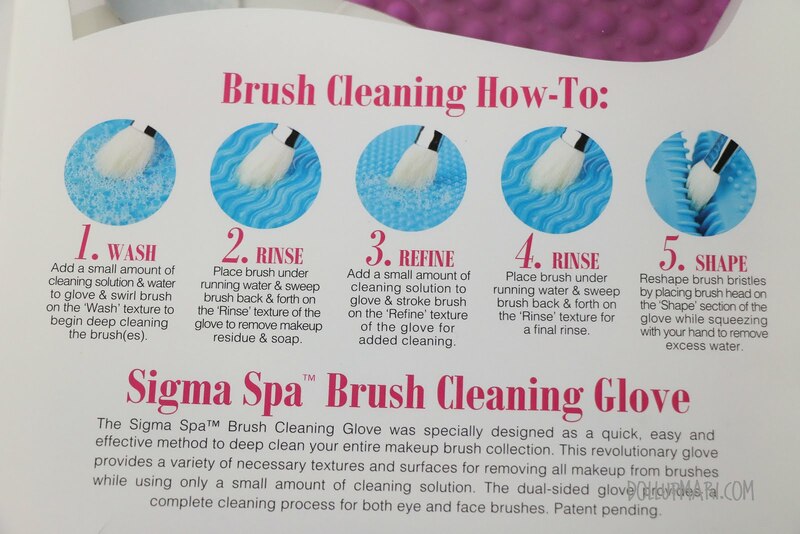 Sigma recommends washing the brush twice in cleaner, the first time getting scrubbed in the wash side and the second time here, but personally what I do is scrub it with shampoo/body wash/soap in the wash side and scrub it here while rinsing the conditioner off. And these are the surfaces for the eye brushes. 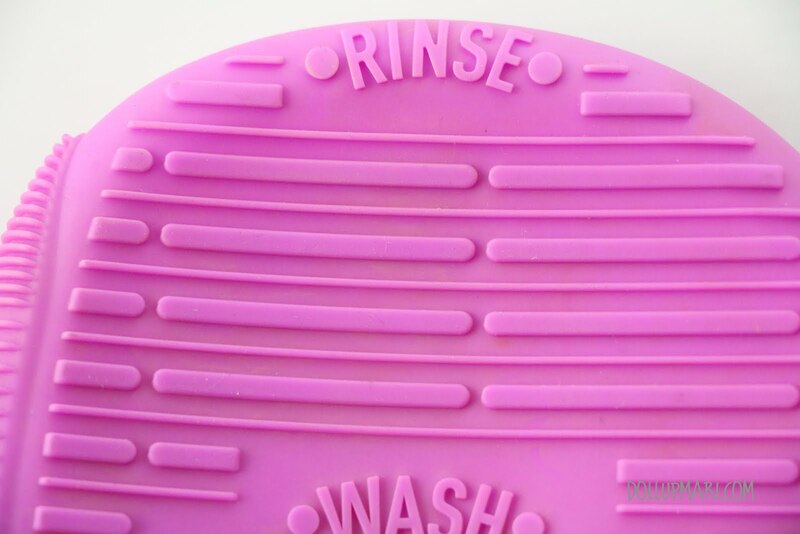 This is the rinse texture for the eye side. More or less washing the brushes here or on the rinse texture of the face side doesn't really matter and I use this and the other interchangeably for eye brushes. However, for face brushes, I strictly use the rinse texture on the face side. And this is the wash texture. 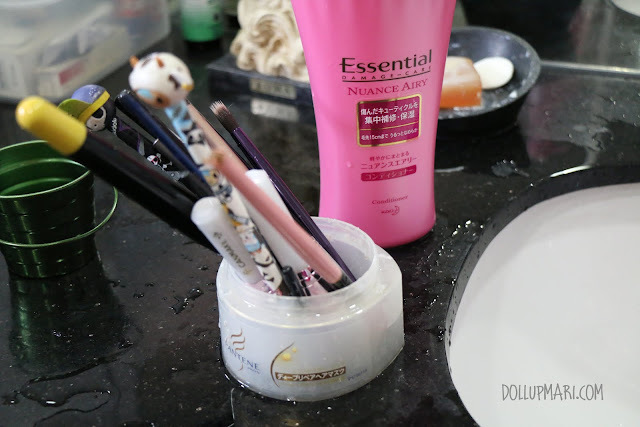 Even if eye brushes are easier to clean, I love how large the surface area is that I can afford to wash 5-8 similarly sized brushes in one scrubbing, compared to 1-3 eye brushes before. The texture is also very helpful in removing residue from eyeliner brushes because it effectively scrubs gel eyeliner off brushes. 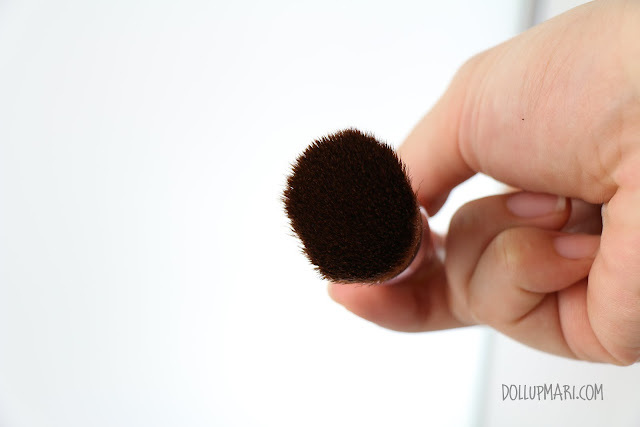 I also like to use this surface for cleaning lip brushes as the wash side of the other side is too large in bumps that nothing will happen to my lip brushes. And this is another refine texture. This is the same as the other side's refine texture. 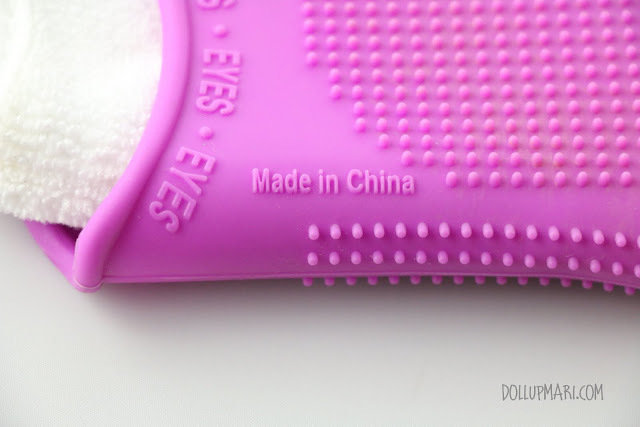 The only thing that made me sad about this product is that it's made in China! I wish it was made in the USA given that it's quite a pricey product. And now let me show you how this brush is at work! These are the brushes I have for cleaning today... 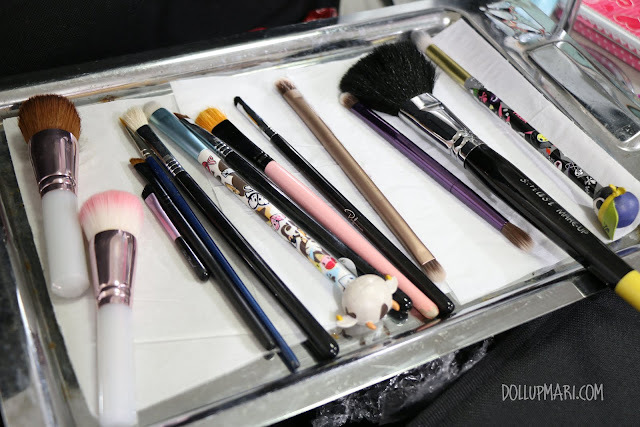 This is about half of my personal brushes-- it's a different story when I just had a gig because I have to wash the brushes immediately, unlike my personal brushes which I clean just about once every 5 usages or once every two weeks. So this is my basic run, I do not use the microfiber insert because I have really sweaty hands and feel that it'll just get stinky really fast. I also feel that it's quite a hassle to keep on washing the insert when I can use the silicone glove alone which is why this is what happens. 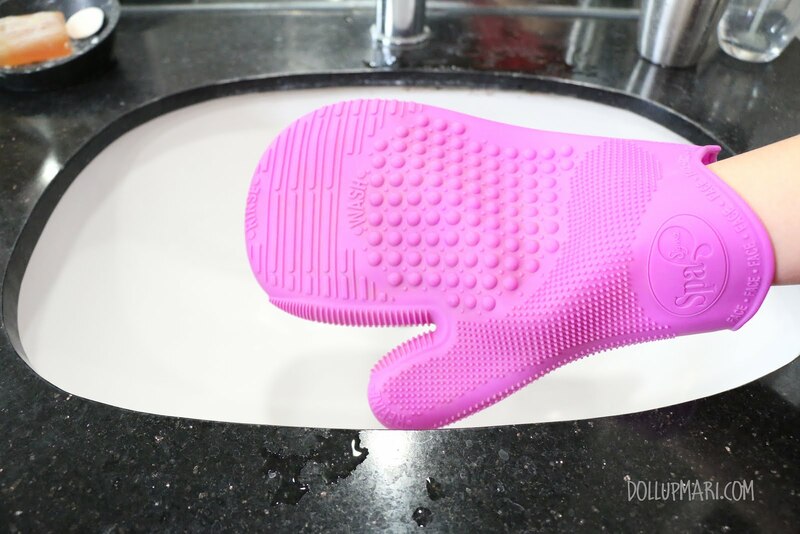 I open the faucet to give the glove a good rinsing to get some water on its surface and wash off any dust it may have accumulated in storage. 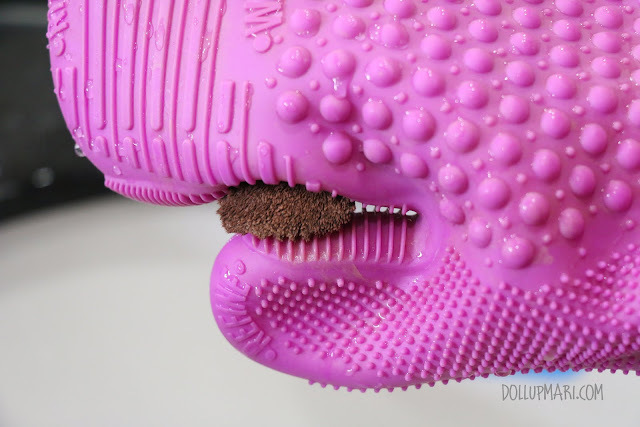 I then bring in my brush (shown here is my Canmake face brush) and wet it first by rubbing on the rinse texture of the face side of the glove. My body wash then comes into action. 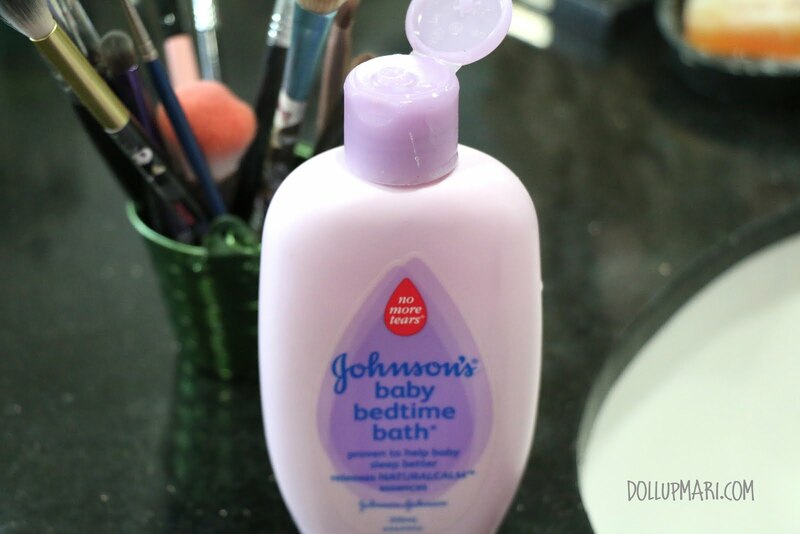 This may be a bottle of Johnson's baby bedtime bath but inside is their milk bath. I just dispensed it into this bottle. In general I use either body wash or shampoo for most brushes, and just use oil based makeup remover for extremely difficult brushes and follow up with soap. You can kind of see how efficient the glove is based on how much residue is getting off of the brush. 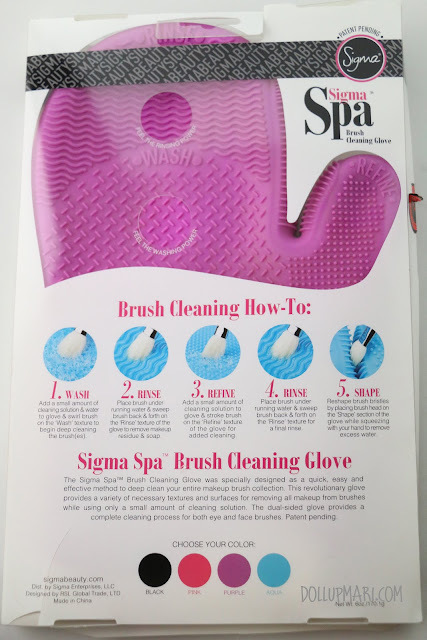 the glove has really made face brush cleaning much more efficient as there really is much more dirt that it can remove compared to scrubbing with soap and my palm alone. This also translates to more savings because this glove may be quite pricey but it's an investment in a sense that I can use really affordable consumables like soap and body wash compared to if I were to have to constantly buy legit brush cleaner. 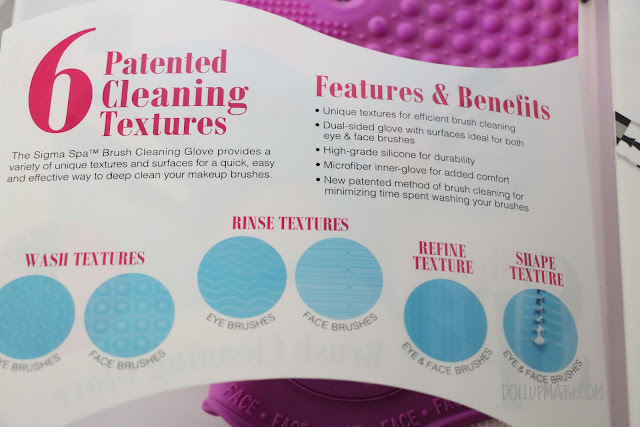 At this rate too, given that no face brush is easy to clean, I needn't use up a lot of brush cleaner if I had it with this glove compared to if I were just to rub my face brushes with brush cleaner on the bottom of a glass. That's all the residue going down the drain. I cannot express how happy I am that I can get this much dirt off my brushes without getting that tired anymore. And this is another important function of the brush I just have to mention. This is called as the shape texture, but personally I call it the dry texture because I squeeze off all the excess water here. 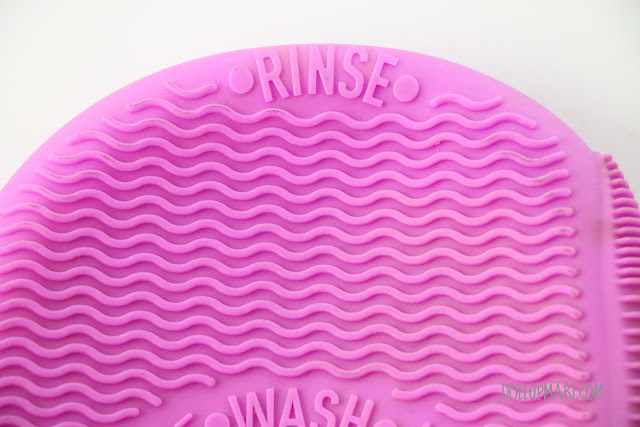 I also love this part because when I scrub the brush on the wash texture, I immediately put it through this so that the excess residue gets removed immediately. I also do this because some brushes are so absorbent that at first glance they may already be clean but there's still a lot of foundation stuck near the core of the brush, and squeezing it here gets it out. It's also a good indicator for me if I still need to put a brush on the wash texture-- a brush that oozes clean water is put in conditioner or rinsed already, while a brush that oozes dirty water or foundation itself is put through another scrubbing. I then dip the brushes and leave them in for about an hour in a tub filled with a little water and conditioner. Today's conditioner is my Essential nuance airy conditioner. The time duration of dipping depends a lot on my energy levels. If I feel energetic and all, I'll just dip them while washing the other brushes, and then I implement a first in first out scheme in washing off the conditioner. For days when I am very lazy, I leave the brushes in conditioner for a day and come back the next day to wash off the conditioner. It's really important to have conditioner in washing your brushes because this will do a lot in keeping the brushes soft and keeping the fibers in tip top shape. I then rinse the conditioner off. For the washing itself, like I previously mentioned I strictly use the rinse surface of the face side, but for washing conditioner off, I use any surface for the task. Once the conditioner is off and I've gotten the excess water off, I put the brushes onto a layer of tissue and leave them to dry. I usually come back 3 hours later to change the tissues and dab the brushes onto the tissues to make sure that I get most of the water out. I then leave the glove to dry. I put it over a bottle to keep it upright and dry both sides. This is my Bioderma sensibio underneath. This is the CanMake brush before cleaning. It's light colored because of all the foundation and powder residue. The brush after the cleaning is now darker in color because the residue is off and this is the brush's natural color. In terms of value for money, this is really dependent on who you're talking to. If you have more than 10 brushes or do makeup everyday, this glove will definitely be helpful. If you are a makeup artist and would like to reduce your brush cleaner usage, this is also a highly recommended product. However, if you own very very few brushes and do not own a face brush, you can live without this product. This is quite a pricey product but for someone like me it's worth it! 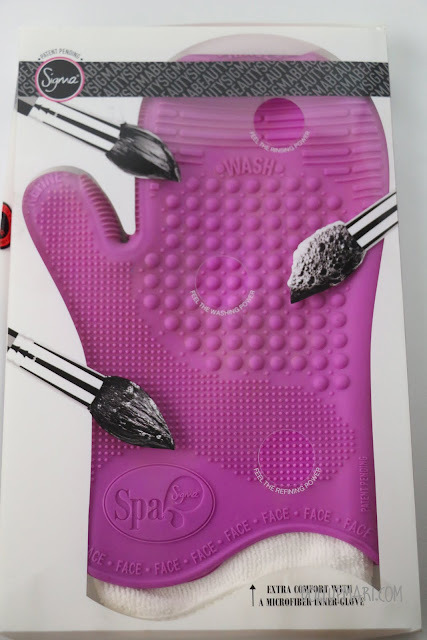 Ever since I got this glove I have never wanted to wash my brushes in any other way. Brush cleaning time has been cut down by 75% and my brushes are now always clean and fragrant and dry well. My brushes are also less vulnerable to tangles and other fiber problems because the brush is textured enough to get the dirt off but not too harsh to harm the brushes. 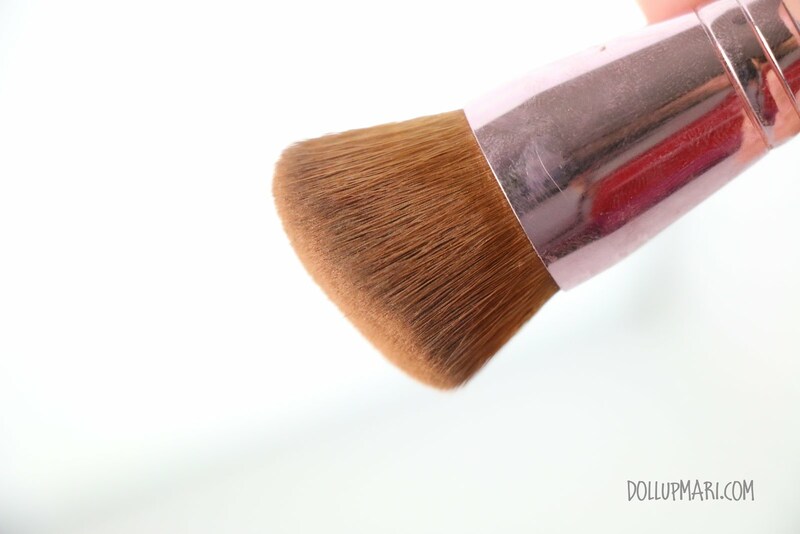 This is a safe way to keep your brushes in tip top shape if you want to clean your brushes all the time. I got this for Php1900 from Beautyholic Manila.